You are here: Home / Finished Projects / Another Peony!! This belongs to my 2011 list of makes as I finished it off with about half an hour to spare before New Year’s Eve festivities began. It was supposed to be a quick dress to make. I mean, it is pretty quick to make up – there are few pattern pieces and it is super straightforward to put together. But, me being me, refused to do things the easy way… So instead I opted to fully line the dress, alter the sleeve length, insert a lapped zipper plus zip guard and then put a lace trim on the hem of the lining! None of which is that difficult to do, but can just be a bit time consuming and fiddly. Especially when a certain somebody should be writing essays! I love working with silk dupion – it’s so crisp and presses like a dream! The only shame is that for me, the fabric just screams formal. So I rarely use it, because I’m not going to the Oscars any time soon and I just want something that looks good to wear everyday. Nevertheless, I was given some lovely silks from my Oma (Grandmother) this year and my fabric stash is now bursting at its seams, so I’ve been trying to think about how to use up my fabrics. For this, I used a green silk dupion (I think this was bought in Thailand many years ago) and matched it with a grey silk lining. The grey silk feels like a china silk or habotai. It feels like such a luxurious dress to wear. I kept the same alterations that I made for the first Peony dress, added length and bust modification. However, on the first dress, I thought the arms were a little too baggy for me. So I narrowed the arms and sort of eyeballed it when I did this. Which of course, resulted in the sleeve opening being too tight! As time was not on my side, I unstitched about 1.5 inches of the seam, then topstitched the seams and made it into a slit. I had run out of black invisible zips and only had a normal black zip left. So I popped a lapped zipper in and zip guard. I love how this gives the garment that old school vintage touch. Then I went a bit overboard and added lace to the hem. In my opinion this is quicker than actually hemming it properly! I’ve had this lace for a while and originally bought it to use for lingerie but decided the trim was too wide for my tastes. 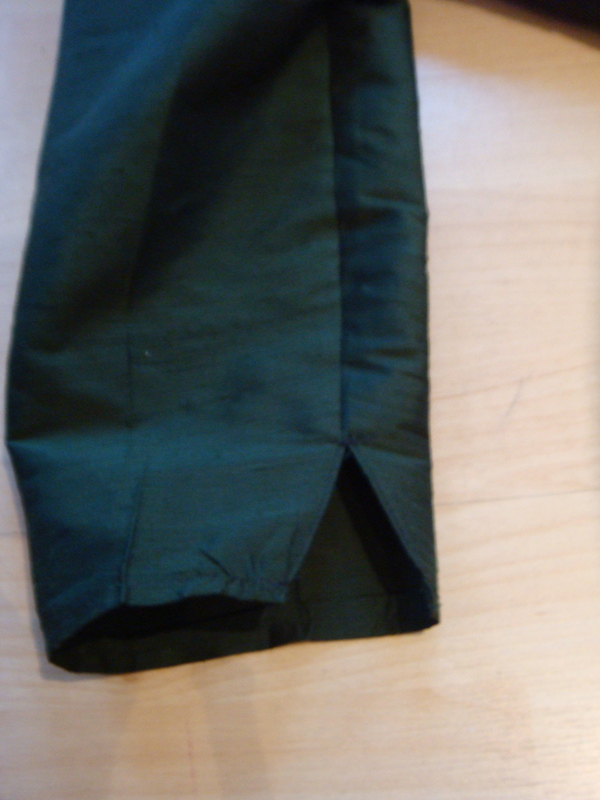 So it was sitting unloved in my chest of drawers, I had just enough for the hem, which was perfect! The photo below best represents the true colour of the dress and lining. « Au revoir 2011 et bonjour 2012! Love the zip and the lace hem! Very pretty dress. Happy new year!